Dura Rez by Phix Doctor is the ultimate all in one ding repair resin, and this handy mini tube is a must have for any surfers kit! 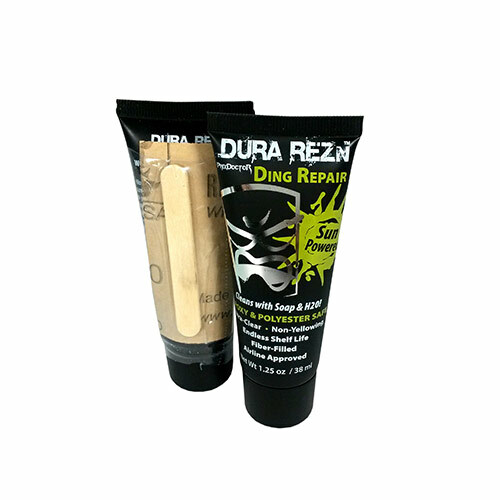 Dura Rez is a fibre filled ding solution which cures in only 2-3 minutes* and fixes both Polyester and Epoxy surfboards! Dura Rez is non-yellowing and is the only product of this kind on the market that can boast an endless shelf life! The durable tube also comes with fix kit including sandpaper and mixing/applying stick. • Comes with fix kit including sandpaper and mixing/applying stick.